Betfred Becher Handicap Chase 3m2f Aintree Saturday – The two stand out statistics for Saturday’s contest have to be that the last seventeen winners were rated under 149, and the last six to pass the post in front, were rated lower than 138, emphasising, that both The Last Samuri (159), and Vicompte Du Noyer (154) have a mountain to climb at the weekend. Age has been no bar to success with the race going to an animal aged 11 or older six times, since its inception in 1992. Indeed, both Oscar Time, and Hello Bud, (for his second win) were teenagers when collecting. Nigel Twiston-Davies has been the most successful trainer with five victories, followed by Paul Nicholls with three. Apart from two wins by the late lamented Dessie Hughes, Black Apalaci (2008), and Vic Venturi (2009), Irish stables have drawn a blank but, they mount a serious challenge for this year’s renewal, not least with the Eric Mc Namara trained 9yo Dare To Endeavour. He was beaten 2 1/4L in last year’s contest by Highland Lodge, and meets him on 4lbs better terms on Saturday. He further demonstrated his aptitude for the Aintree Spruce, when completing in the Topham Trophy in April, and having pleased his trainer with a decent run in a Limerick 3m chase eight weeks ago, he comes here with plenty of stable confidence behind him, particularly if it comes up soft. The 8yo Ucello Conti was trained in France until joining the Elliott Academy at the end of last year. He had won eight of his thirteen starts across the channel, including a 3yo chase at Auteil, but was never tried beyond 21f. Shrewd trainer that Gordon Elliott is, he recognised the animal as a stayer, and he duly ran a very solid race in his first attempt at a trip, when finishing third in the 25f Thyestes Chase last January, in bog like conditions. He was sent off a 25/1 shot for the Grand National next time out, and demonstrated that the Aintree obstacles held no fears for him when, he ran a great race to finish 6th off a mark of 149. Retired for the season, he had a nice pipe opener over hurdles at Navan twenty days ago. He doesn’t look badly treated on a mark of 148, and coming from this yard, which can do no wrong at the moment, looks worthy of his prominent position in the market. Fergal O’Briens tough staying veteran, the 11yo Alvarado, has been placed twice in the National, and, having run another fine race in the Scottish equivalent last April, where he finished 2nd, off a mark of 135, upped stumps for the season. He made a highly satisfactory reappearance behind Saturday’s opponent, Viconte Du Noyer at Cheltenham three weeks ago, where, having lost his place at the 15th fence, ran on well from the 3rd last to finish 6th, 7L behind the Tizzard horse. He meets Viconte Du Noyer on 10lbs better terms at the weekend and with only 10st2lbs in the plate is another to make plenty of appeal. Mouse Morris runs his Irish Grand National winner Rogue Angel and the 8yo looks realistically treated on a mark of 145, 7lbs higher than for his hard fought Fairyhouse victory. Thought to have needed his two outings this season, in the Munster and Cork Nationals, Morris, the hugely talented trainer of this year’s Grand National winner, Rule The World, is quite bullish about the chances of Rogue Angel, expecting “great improvement” from his last run. It is 15 years since the legendary Ginger McCain won this with subsequent Aintree Hero Amberleigh House, and I’m sure son Donald would love to emulate his dad, by winning this with the 7yo Knock House, for one of his most loyal supporters, Tim Leslie. He ran a very promising race at the Cheltenham Festival, where, despite being badly hampered at the 13th fence, rallied to finish 4th in a field of 22 runners, off a mark of 144. He disappointed 3weeks later and was retired for the season. He makes his reappearance on Saturday off a generous looking mark of 141 giving him a racing weight of 10st8lbs and as he can go well fresh is another to consider. Read the Oddsguru’s 2015 Becher Handicap Chase preview. Alan King runs Ziga Boy, and as he has won in December for the last two years, this certainly looks like his time of year. Having won last December off a mark of 117, he put up a real eye catching performance off a 16lbs higher mark next time, when winning a Class1 Doncaster handicap by 3 1/4L and 1/2L from the useful pair Coologue and Buywise at the end of January. He disappointed in his two following runs, both at Kempton, and was put away until reappearing in a 3m Bangor handicap chase 24 days ago. Needing the race, he finished a respectable 5th off a mark of 138 and lines up on Saturday on a 1lb lower mark. Having won this with West End Rocker in 2011, King knows what is required, and it will come as no surprise to see this good jumper, (has never fallen) involved at the business end. Crabbie’s Grand National 4m 3 1/2f Aintree Saturday – Our e.w. selection, Saint Are, gave us a great run for our money, finishing second in last year’s renewal of the great race, at the rewarding odds of 40/1, so let’s hope we can go one better this time. The 2015 winner Many Clouds carried 11st 9lbs to victory, the highest since Red Rum in 1974, and this year heads up the weights with 11st 10lbs. His preparation last year had been geared towards the Gold Cup ( in which he finished a well beaten 6th ), and his participation at Aintree was something of an afterthought, so this time, with his programme aimed specifically at the National can we expect a repeat? Well he did win his prep race at Kelso, a contest he was fully entitled to collect, comfortably enough in early March, but interestingly the time gap between that race and Aintree is not much different than last year’s interval between the Gold Cup and the National. This years renewal of the Aintree Spectacular is reckoned to be one of the “classiest” of recent years, at least a 3lbs better race than last year, so arguably Many Clouds needs to improve again to carry top weight to victory. Having said that he does have a lot in his favour and deserves his place at the top of the market. Many doubters had to eat their words when Paul Nicholls’ wonderful 10yo Silviniaco Conti hosed up in the Betfair Ascot Chase in Febuary, having previously been pulled up in the King George at Kempton. This marvellous racehorse who has won eight times at Grade 1 level and amassed over £1,000,000 in prize money is certainly not finished yet, and has to be on the short list. Ucello Conti is a half brother to the above paragon, and in the hands of master trainer Gordon Elliott, responsible for the 2007 winner, Silver Birch, also has plenty to recommend him. Previously trained in France, and a winner of over £250,000 in prize money, he won at his first attempt over the larger obstacles as a 3yo way back in 2011, and has only come to grief once in his subsequent sixteen chases. His three runs for Elliott have included a 2nd in the Paddy Power at Leopardstown and a 3rd in the Thyestes at Gowran Park showing steady progress, and earning him a rating of 149, giving him an assured place in Saturday’s line up. His trainer thinks him a “natural” for Aintree so at current odds of 33/1 is worth considering. It must seem an eternity to trainer Kim Bailey since the glory days of 1990 and 1995 when he won the National with Mr Frisk, the Champion Hurdle with Alderbrook, and the Gold Cup with Master Oats, but perhaps with the talented 8yo The Last Samurai the good times may be here again. He was no slouch when trained by Donald McCain last year winning three of his five starts, but in the care of Mr Bailey his form hit a new high when impressively winning The Grimthorpe Chase at Doncaster last time out. The Doncaster race has been a good guide in the past with three winners, Ben Nevis, Corbiere,and Amberleigh House going on to victory at Aintree. With just 10st8lbs to carry The Last Samurai looks really well treated and is short listed. There is something in the Merseyside air that brings out the best in Saint Are as he seems to reserve his best for Aintree. A winner of a Grade1 hurdle here as a 5yo, he has also won a Class1 chase over the Mildmay course, and last years second in the National itself was outstanding. His handler, Tom George says that he is a”Spring” horse, confirmed by his recent Doncaster success. Definitely worth considering! For a horse with such an impressive C.V. the Willie Mullins trained Sir Des Champs looks well treated with just 10st13lbs on his back. He had a great season in 2013 winning the Grade1 Hennessy Gold Cup, coming second in the Cheltenham Gold Cup and winning the Punchestown equivalent. Unfortunately he was injured in the same years Lexus, and was off the course for 700 days. He reappeared last November at Thurles and seemed to have retained plenty of enthusiasm when winning easily. He has been disappointing in his two subsequent runs on very holding ground in the Lexus and Hennessy at Leopardstown but he is a horse who probably needs decent ground to show his best and may well find his ideal conditions on Saturday. Another who returned to action after a long break is P Fahy’s 9yo Morning Assembly. Off for 20 months he reappeared at Fairyhouse in January and finishing strongly he went down by a head. He was second again at Gowran Park in Febuary and ran his best race last time when finishing 4th of 23 at the Cheltenham festival to Un Temp Pour Tout. Ridden by the shrewd Davy Russell he is worth a second look. By the same sire Dom Alco, and in the same ownership as the 2012 winner Neptune Collonges, the Paul Nicholls trained Unioniste has possibilities. Attempting last year to be the first 7yo since Bogskar won in 1940 to collect he fell, but, as he was probably attempting the impossible anyhow with 11st 6lbs in the plate, and as this was his only lapse in twenty races, he is easily forgiven. He did his prospects no harm when finishing second to Many Clouds at Kelso last time, and this year, he is much more realistically weighted with 10st8lbs. With another year on his back he looks set to run a big race and could well tie up this years trainers championship for P.Nicholls. Paul Nicholls runs the 9yo Rocky Creek, and is another who has a lot going for him. In last year’s race he was travelling well and jumping superbly until running out of petrol at the 2nd last, and faded into a well beaten 5th. Having put up Pineau De Re, as one of our two selections in last years renewal, we feel that the Dr Newland trained 12yo is well worth a second look again this time. He came into last years race off a superb performance in the Pertemps Hurdle Final at the Cheltenham Festival where he finished an unlucky third. He has followed the same route this year, finishing a respectable 11th of 23, in the Pertemps despite suffering some interference. Indeed he was running on strongly at the finish of what was a rough contest, demonstrating his continuing enthusiasm for the game. His highly talented trainer is bullish about his chances, and considering how well previous winners have performed in subsequent renewals of the great race, he does seem to have place prospects at least. Alan King, who has enjoyed such a fruitful season runs the 9yo Godsmejudge, and Saturday has been his target all season. 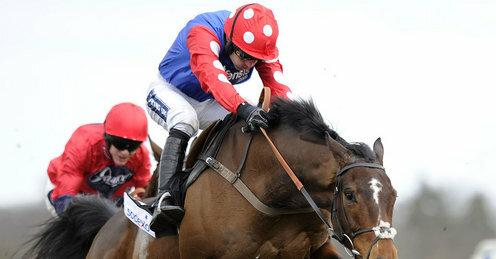 Having won and been runner up in the last two renewals of the Scottish National his stamina for Aintree seems assured. Indeed in last years national North of the border, it was stamina that got him to within 1 1/2L of the winner, Al Co, having been 4L behind jumping the last. He is now 5lbs better off with Al Co, and with 10st8lbs on his back does look well handicapped. One for the short list! Even without the Mc Coy factor, Jonjo O’Neill’s 8yo Shutthefrontdoor would surely be one of the favourites on Saturday. By Accordion out of a Strong Gale mare, his pedigree is all about stamina, a point strongly emphasised by his staying on win in last years Irish National, (3m5f), which he won off a mark of 143. Confirming his wellbeing, and his ability to run well fresh, he reappeared seven months later, easily landing a conditions race at Carlisle in November. Put away with Saturday in mind, the one reservation would be his handicap Mark, 7lbs higher than his 3/4L win in the Irish National. However with Mc Coy aboard he does seem to have a great chance. Paul Nicholls runs the 9yo Rocky Creek, and is another who has a lot going for him. In last year’s race he was travelling well and jumping superbly until running out of petrol at the 2nd last, and faded into a well beaten 5th. he had a wind operation over the summer, and judging by his win at Kempton (Feb 21) it must be judged a success. He escapes a penalty for Kempton, as it came after the National weights were published, so is effectively 7lbs well in on Saturday. If his stamina holds out, and the omens look good, this sound jumper must have a great chance of being involved at the business end at the weekend. Something about Liverpool certainly seems to suit the Tom George trained Saint Are, as he seems to reserve his best performances for the place. Winner of a Gd1 hurdle here as a 5yo, he won a Cl 1 chase over the Mildmay course as a 6yo, and ran another fine race when finishing 3rd over the National fences last December. Having been outpaced, he was only 7th at the 2nd last, but ran on really well to be only 3 3/4L adrift at the post. He won easily last time out,(3m1f) in Febuary, so back at his favourite venue, he is certainly worth a second look. The David Pipe trained Soll has certainly thrived since joining the Nicholshayne team this season. He has won his last two races, most recently a Newbury veterans handicap (3m2 1/2f Feb 28) again after the National weights were published, and so escaping a penalty. Nicely handicapped, with just 10st2lbs to carry, with the in form Tom Scudamore in the saddle, he certainly catches the eye. He jumped around in the race two years ago, finishing seventh, and looks a much improved animal now. well worth considering. Keith Revely’s Night in Milan is another who has been aimed at the National all season. Something of a Doncaster specialist, he won last years Grimthorpe Chase, and came third in this years renewal. As the Grimthorpe has been a good guide in the past, this prominent racing, sound jumper is another to consider.